Copyright Sue Walters 2002. 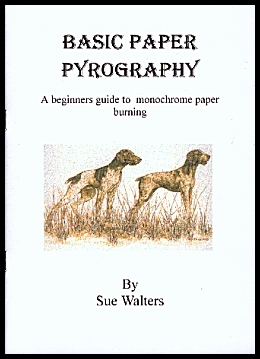 No part of this publication can be copied, sold or used without the direct permission of Sue Walters. G'day, my name is Sue Walters and I'd like to welcome you to the first of the news letters I will share about the art of pyrography. Oh, by the way, being an Aussie I usually have to watch I don't add too much 'slang' to my writing or all you mob get a bit lost. I'll try not get too 'Aussie' on you, but hey, I'm sure you wont mind if I'm more myself here. If you have any questions at all, give me a hoy and I'll try my best to explain. Well...on with the show for edition one. Fading of burnt images is one of the biggest hurdles we pyrographers face to gain acceptance in the art world. I have decided I would carry out a series of fade tests and photograph the findings for all to see. I have only just started this process with wood because they will be quite extensive and I simply didn't find the time to get them underway in the past. It's my hope that the findings will help us choose our materials with more knowledge and perhaps find ways of eliminating this problem. In the mean time, I have already conducted some basic fade tests on paper and tagua. I will be doing more tests on these materials in the future by trialing some more finishes and protective means on paper...such as U.V. protective spray and museum glass. But for now I can release some interesting finding on the basic tests. I started burning on paper as far back as 1994. For those of you who haven't tried it, do! It's a lot of fun and not nearly as impossible as it sounds. It also looks great. I was curious if burnt marks on paper would also fade in strong light as they do on wood. The earliest of these tests was started in late 1998 and were not removed from the light source until early Feb 2000. So you can see that I gave them decent time to 'cook' under the strong Australian sun. The 'other side' was hidden in a cupboard in total darkness. As you can see below, there was certainly a decent amount of fading of the section left in the sun. It will of course be rare for a picture to hang in this situation...and if you are considering it, I'm sure the test will make you think twice. But what I found the most interesting was comparing this test to that of the second paper test. I found that spraying paper with a paper varnish and then exposing it to direct light will hasten the fade. I think this has to do with it actually magnifying the sun/light but am unsure. I also found that the darker/deeper the burn, the less it will fade. Possible solutions to paper burning situated in strong light? U.V. protective sprays or placing the piece under U.V. protective glass. This glass is more expensive to buy than the usual picture glass, but for a piece of significant value, it may well be worth it. Costs can be reduced by buying the glass yourself and cutting it or getting your local glazier to cut it. (A frame shop is likely to charge an arm and a leg if you ask them to include it in the framing.) It's a little hard to find, but wholesale frame suppliers should be able to help you out. I think my glass is from America, so you people State side might get it a little easier than I found. The other possible consideration could be to use reflective glass over the non reflective. This might divert some of the light away from the picture surface....but I'm not real sure of this. OUTSIDE FADE TEST - Start Nov 1998, End Feb 2000 As you can see, there is significant fading in the test. The paper was burnt and the then cut in 3 parts. Part one was left in full sun coming through a window. Part 2 was sprayed with mat picture varnish, not UV protected. Part 3 was put in the dark for the duration. INSIDE FADE TEST - start Nov 1998, end Feb 2000 Well....nothing too faded about this that I can see. Perhaps a TAD on the patch burnt with the shader. 'A' is the piece hidden away, 'B' is the piece left out. The light source was indirect light from a double window which is approx 6 feet from where the paper was pinned to the wall. I also have 100W incandescent light overhead, which is always on when I work, regardless if it's day or night. Well! THIS was very interesting and surprising. 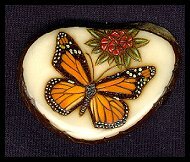 I started experimenting and extensively burning on tagua around a year ago. Dear Peg Wood kindly sent me some slices to try and I've been in love with it ever since. I love that it's white to burn on, that is has weight, that you can make great jewelry from it, is popular with customers and that it looks and feels just like ivory, but no elephants were harmed in the making of this art. In fact, tagua growing and harvesting are helping save the rain forests of Ecuador. Like paper, I was very interested to see if burnt images on tagua would fade. There weren't even any rumours of this amongst pyrographers as tagua burning seems very new except for a few crude craft applications in the past. So...I set out to test the fading of a burnt image on tagua approx 8 months ago. This time also included my summer months, so it got a real work out. The test comprised of burning a series of lines and patches across a single piece of tagua, then half of the tagua was screened from the sun with cardboard. It was then placed on the sill of a very sunny window for 8 months. I admit that I expected some fading at least, but was stunned when I returned from Canada, took off the screen and saw there was NO fading at all! In fact, the side that was in the sun was cracked and checked from the beating it took from the sun, but no fading at all was evident. The only thing I can think of is that burning tagua 'meat' actually cooks it and creates a different property than the carbon formed during wood and paper burning. I'm sure one happy puppy though! This is one art/craft material where I don't have to worry about the fade aspect. Can tagua burning fade from other means? Yes, I think it can from experience. This largely depends on the finish applied to the piece. Oils or varnishes that yellow wood can cause the image to fade by yellowing the white of the tagua....creating less contrast in the original image. Unsealed tagua will also fade if allowed to get wet or rub up against things. TAGUA FADE TEST - 8 months 'A' is the side that was exposed to the sun. Note how side A is heavily checked from the sun baking it, but there is no fading that can be seen in comparison to side 'B', which was hidden from the sun and light. I'll bring you the results of any future fade tests as they come to hand, but if you have any fade experience that you can tell me about, please write and I'll include them in a fade data base to be created later on. How about you gourd burners? What are your experiences with fading? 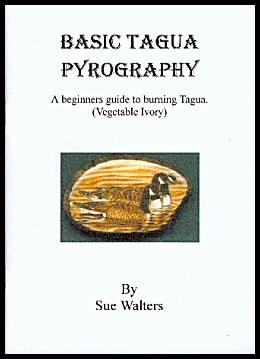 Due to the high number of enquires I receive regarding burning on tagua and paper, I have written an instructional booklet on each subject. They are designed as a beginners guide to get the novice started in each of these mediums. Both are challenging in their own right, but are also highly rewarding to burn on. These booklets will show you the basic strokes, how to prepare and choose your material, some pitfalls, some tips, finishes and how to fix mistakes if you make them. Ever wanted to burn jewelry but wood just wouldn't cut it? (Sorry, pun intended:)) When Tagua nuts are sliced they make wonderful pendants and pins. The whole nut makes a unique little ornament. And to top it off, tagua feels and looks just like ivory and will last just as long! How can I buy a copy of this booklet? Click here! Looking for a white surface to burn pictures on? Tired of making trips to the lumber yard/craft store searching for that clean piece of wood? Paper might just be the answer. Burning on paper is not as hard as you may think, in fact it's easy! 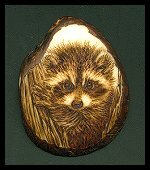 Paper can be bought from craft and art stores, the resulting picture can be easily framed and pyrography on paper has a unique, antique appeal. Monochrome: A painting or picture done in different shades of the one colour. Monochrome is a term I use quite often in reference to burnt only work with no colour added. Deb Howard is a talented burner from Anaheim, CA. who specializes in equine pyrography. For those of you who think that an expensive pen is necessary to achieve a detailed burn, just look what Deb can do with an old set temperature pen. It's a small site for now, but well worth the visit to see some fine tonal, monochrome burning. Pyrographer Vickie Wessel is noted for her realistic portrayal of monochrome wildlife and has produced an instructional book detailing the steps she takes to burn a realistic bear in a natural setting. And realistic it certainly is! The 19 page black and white book is very well written, with clear instructions to guide the reader though the various techniques used to create a realistic picture. Even though this book is specific to burning a bear, it's instructions can easily be applied to other subject matter. I was particularly taken with Vickie's description of burning a very realistic fur coat...a technique that can be applied to any short coated animal. Some of the subjects covered include tools used, wood selection, transferring the picture (with an excellent tip on gamma correction), how to draw free hand foreground plants and surrounding, fur burning, eye and nose burning and finishing the piece. The cost of the book is $13.00 USD including shipping. It's a good read and will help demystify realism animal burning, for the beginner in particular. To buy the book or to just enjoy Vickie's web site, please visit Wildlife and Woodland Art. Did you know? That soldiers in WW1 had trouble with rats eating the buttons off their uniforms. Seems the rats developed a taste for tagua nut, the material the buttons were made of. Taking photos of pyrography can be frustrating because of flash glare kicking back off the irregular and shiny surfaces of the work. To help, tape a few layers of tissue paper over the flash to diffuse the light. A clean nib is ESSENTIAL for good burning. Skews and cutting pens should also be kept sharp. A build up of carbon and muck will hinder good heat transfer and smooth travel of your nib across the surface. Well folks, that's all for the first edition of my newsletter. I sure hope you got something out of it. Have fun and happy burning.